This review has been printed in the April 2018 issue of Chess Life. A penultimate (and unedited) version of the review is reproduced here. Minor differences may exist between this and the printed version. My thanks to the good folks at Chess Life for allowing me to do so. Collins, Sam. A Simple Chess Opening Repertoire for White. London: Gambit Publications, 2016. ISBN 978-1910093825. PB 160pp. Moret, Vincent. My First Chess Opening Repertoire for Black: A Ready-to-go-Package for Ambitious Beginners. Alkmaar: New in Chess, 2017. ISBN 978-9056917463. PB 272pp. Moret, Vincent. My First Chess Opening Repertoire for White: A Ready-to-go-Package for Ambitious Beginners. Alkmaar: New in Chess, 2016. ISBN 978-9056916336. PB 208pp. Most chess players like very little more than to talk about their openings. (The only thing that might top it is the cosmic unfairness of their last tournament losses.) They talk about what they’re playing, what they want to play, and opening trends among the chess elite. But when it comes to the question of which openings they should play, there’s rather less discussion. Here I should forestall some criticism. In what follows, I am not arguing that any specific opening or opening system is intrinsically better than any other. Modern computer analysis shows us that, for the vast majority of players, most mainstream openings are entirely playable. But it may well be the case that some openings are better than others if improvement – understood both in terms of over-the-board results and playing strength – is our goal. The late Ken Smith believed that lower-rated players should play simple “forcing systems” like the Bird, Colle, or King’s Indian Attack for White, and complementary systems like the Caro-Kann and Slav for Black. The idea is clear: if you know your opening’s ideas and typical structures better than your opponent, and you get a position you understand on the board, your chances of winning are increased. Another typical recommendation, and one that Smith – who wrote in “Improving Your Chess” that “[u]ntil you are at least a high Class A player… [y]our first name is ‘Tactics,’ your middle name is ‘Tactics,’ and your last name is ‘Tactics’” – would applaud, is the use of gambits to force the game into tactical channels. Here again, the idea is clear: improving players need to hone their tactics, and gambit openings require those players to play sharply from the very first moves of the game. The Smith-Morra Gambit, named in part for Ken Smith, would be a good choice in this vein, as would the Blackmar-Diemer or Latvian Gambits. The ‘Markovich Doctrine’ represents something of a median between these two (apparent) extremes. Named for its author, the late Ohio master Mark Morss (’Markovich’ in the chesspub.com forums), the idea here is that “open positions are fundamental… you must know how to play open positions well in order to play chess well.” Because all positions can potentially become open, an emphasis on tactics and active piece play is critical for long-term success. Towards this end, Morss argued – passionately, if somewhat dogmatically – that improving players needed to play 1.e4 e5 with Black, particularly the Two Knights Defense and the Classical Ruy Lopez, along with the Tarrasch Defense against closed openings. This emphasis on open games and Isolated Queen’s Pawn (‘IQP’) positions also colored his choices with the White pieces, with the ‘Waitzkin variation’ of the Exchange French (1.e4 e6 2.d4 d5 3.exd5 exd4 4.c4) being a typical Morss recommendation. Players learn how to handle both sides of the IQP, but in doing so, they also learn how to play active, tactical chess. Sam Collins, who recently scored his 3rd and final Grandmaster norm, presents something of a hybrid between the first and third approaches described above in his A Simple Chess Opening Repertoire for White. Borrowing in part from some of his earlier works, including An Attacking Repertoire for White and the ChessBase DVD 1.e4 Repertoire: Grandmaster Lines Explained for Club Players, the emphasis here is on the IQP. Collins justifies this decision (6-7) with three claims. (a) The IQP and its constellation of related structures can emerge from a wide range of openings, so it is important for players of all strengths to learn and understand it. (b) IQP positions are playable for both sides. 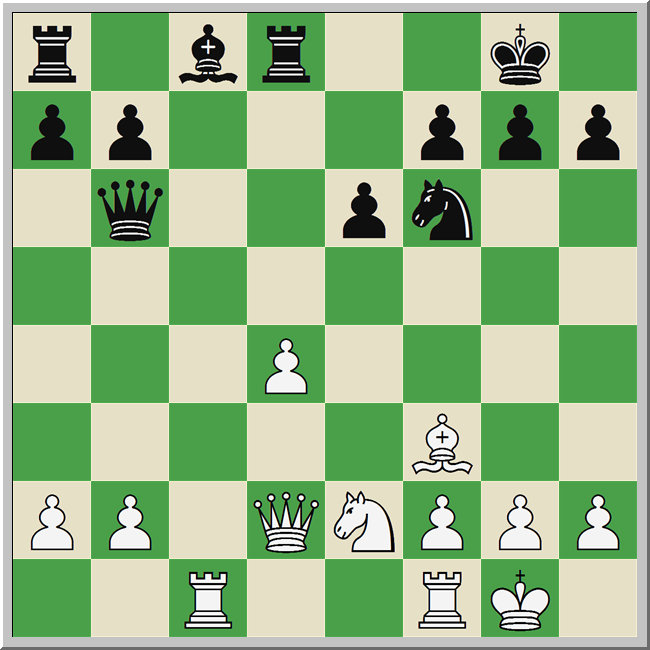 Those with the IQP get some space and activity, while those playing against it usually have a defined weakness to play against and chances for a better endgame. Finally, in light of (a) and (b), Collins rightly argues (c) that it is possible to reach IQP positions in a healthy number of your games, making their study rapid and practical. While some of Collins’ choices are perhaps underrated by mainstream theory – Lawrence Trent used 7.Nbd2 in the Giuoco Piano to draw Kramnik in the Isle of Man tournament last September –his goal is not necessarily a clear opening advantage. Instead, I’d argue that these repertoire choices are designed to leave White in familiar, active-ish positions from which he can outplay his opponent. White has some compensation for his long-term weakness, the IQP, with his active pieces and better development. But Black has already exchanged two minor pieces, and once he solves his development problems with …Bd7 or …e5, he should be at least equal. While this variation does take Black out of standard French-style positions, it’s hardly something to worry a prepared player. I have to admit my difficulties in grasping the inner logic of Moret’s choices on a first read. There is no ‘typical position’ to be found a la Collins, and the repertoire does not fit neatly into any of the three types listed above. With more careful study, I slowly came to realize that, despite the widely disparate set of recommendations, there was indeed an intended common thread. Moret aims for positions with clear themes and ideas, often involving direct kingside attacks, and where knowledge of plans trumps memorized theory. Moret says as much in the introduction to his Black repertoire. Moret’s book is structured according to this philosophy. The Grand Prix Attack and the King’s Indian Attack clearly involve typical moves and maneuvers, as do the Scandinavian, Albin, and Stonewall. Each recommendation is introduced with copious structural and strategic instructions, in contrast to Collins’ fairly traditional analytical style, and newly acquired knowledge is tested with exercises at the end of each chapter. For all of this, I remain skeptical about parts of Moret’s recommendations. Some of the proposals, like the Möller Attack, require rather more theoretical knowledge than Moret would have us believe, and the sharpest lines of the Scandinavian Portuguese require extensive study if Black is to survive the opening. Other suggestions, like the King’s Indian Attack agains the French, seem too strategically complex for most juniors. It may be the case that Moret’s talented students, many of whom compete in World Junior Championships, can handle these kind of complexities, but I suspect that most chess mortals would do better with simpler openings. There are also some important omissions. The Fritz Variation (5. …Nd4) in the Two Knights is not addressed, for example, and a 2011 Avrukh innovation in the Grand Prix Attack (1.e4 c5 2.Nc3 Nc6 3.f4 e6 4.Nf3 d5 5.Bb5 Nge7 6.exd5 exd5 7.Qe2 f6!) does not appear in the text. White’s difficulties in this last line, and more broadly where Black plays …e6 and …d5 against the Grand Prix, are somewhat glossed over. So where do we stand after all of this? Ultimately I think that while both Collins and Moret provide responsible, interesting repertoires, and while I particularly applaud Collins for the amount of useful information he managed to distill into the 160 pages of his book, I am not convinced that either author makes things ‘simple’ enough for most people’s ‘first’ repertoires. This is, admittedly, a big ask, and I’ve yet to find a book pitched to precisely that market. The closest thing I’ve found is a public e-book by the English chess coach David Regis. His Four Opening Systems to Start With follows the spirit of the Markovich Doctrine but keeps things very simple and light. I consider it a good prolegomena to serious opening work, and it might be a decent stepping-stool to the more complex repertoires of Collins and Moret. This entry was posted in Instructional, Openings and tagged Mark Morss, Sam Collins, Vincent Moret on April 1, 2018 by fullcityplus. This review has been printed in the October 2016 issue of Chess Life. A penultimate (and unedited) version of the review is reproduced here. My thanks to the good folks at Chess Life for allowing me to do so. Collins, Sam. Karpov: Move by Move. London: Everyman Chess, 2015. ISBN 978-1781942291. PB 288pp. List $27.95. Engqvist, Thomas. Stein: Move by Move. London: Everyman Chess, 2016. ISBN 978-1781942697. PB 496pp. List $34.95. Franco, Zenón. Rubinstein: Move by Move. London: Everyman Chess, 2016. ISBN 978-1781943144. PB 400pp. List $29.95. Franco, Zenón. Spassky: Move by Move. London: Everyman Chess, 2016. ISBN 978-1781942666. PB 464pp. List $29.95. Giddens, Steve. Alekhine: Move by Move. London: Everyman Chess, 2016. ISBN 978-1781943175. PB 304pp. List $27.95. Lakdawala, Cyrus. Fischer: Move by Move. London: Everyman Chess, 2016. ISBN 978-1781942727. PB 400pp. List $29.95. Pritchett, Craig. Steinitz: Move by Move. London: Everyman Chess, 2016. ISBN 978-1781942543. PB 288pp. List $27.95. Some years ago I gave a talk at a university in New York about how we might use the technology of chess to better understand the nature of technology. I argued that modern chess players were, for all intents and purposes, cyborgs, and I meant this fairly literally. The dividing line between man and machine is blurred in contemporary chess, with top young players internalizing the lessons taught by Komodo and Stockfish so deeply that they begin to play like computers themselves. The rise of the machines has wrought many changes in our beloved game, and none so lamentable as the slackening of historical memory among its players. There are many GMs today who proudly gained their titles without studying the classics of chess literature. And it kind of makes sense: if chess today has mutated, becoming intensely concrete and pragmatic, why study Alekhine’s games when (a) they no longer resemble modern practice and (b) the computer tears apart his analysis? As a chess teacher and a fan of chess history, this gives me the sads. The majority of chess players would benefit greatly from a grounding in the classics; as John Watson puts it, “classic games by the old masters make particularly good teaching material, because the strategic ideas in them are relatively simpler to understand and more clearly expressed than in modern games.” Such study can also be pleasurable, something I find difficult with modern and inscrutable super-GM contests. This month I take a look at eight recent biographies / individual game collections from Everyman, one of the most prolific publishers of such books today. All eight appear in their Move by Move (hereafter, MBM) series. Most current Everyman books are presented in this way, using a question and answer format to mimic a private lesson and functioning as a kind of Greek chorus for the proceedings. Steve Giddens’ Alekhine: MBM is, in contrast, almost wholly a games collection. Giddens analyzes thirty-five of Alekhine’s games and includes twenty positions from Alekhine’s play for the reader to solve. He tends to use more words and less concrete analysis in explaining Alekhine’s moves, making this book excellent for the lower-rated player. I did find it curious that Giddens relied on a seven year old engine (Fritz 12) to check his lines, and I also would have appreciated some biographical content – there is almost none in the book. Stein: MBM is the largest book on review here at 496 pages, and this is made all the more impressive by the fact that it uses a smaller font than the others! Thomas Engqvist does an impressive job of contextualizing each of the sixty thoroughly annotated games in Stein: MBM, explaining who the opponents were and incorporating extensive research into the notes. He carefully traces Stein’s progression from “new Tal” to complete player, attributing some of the shift to Petrosian’s influence. All of this makes for a wonderful book, and it should become the standard work on Stein’s life and games. Sam Collins’ Karpov: MBM is, by the author’s own admission, neither a biography nor a collection of Karpov’s best games. Collins chose to “select a number of aspects of Karpov’s play which could be helpful to club players.” (7) He uses Karpov’s games to illustrate typical middlegame themes – prophylaxis, the IQP, etc. – and supplements this with sketches of his opening play and a selection of games from his famous Linares 1994 tournament victory. This is a novel approach, but unless you’re particularly interested in Karpov’s games under these exact parameters, I think this is a title you can safely skip. This leaves us with two books each by two of Everyman’s most prolific Move by Move authors, Zenón Franco and Cyrus Lakdawala. Attentive readers will recall that I have already reviewed books by Franco (Anand: MBM) and Lakdawala (Carlsen: MBM) in the February 2015 issue, and that I was decidedly less impressed with Lakdawala than I was with Franco. That opinion has not changed, and in the remainder of this month’s column, I’ll explain why. Franco’s books – Rubinstein: MBM and Spassky: MBM – are both thematically structured works that focus on the player’s games and not on their biographies. Both books are scrupulously sourced and work to expose the reader to the specific strengths of the player in question. With Rubinstein, for example, Franco analyzes thirty-four games that center on Rubinstein’s positional play (§1) and endgames, with special emphasis on his rook endings (§3,4). The forty games in Spassky: MBM revolve around Spassky’s handling of the initiative and his special expertise in favored opening systems. Both titles begin with studies of each player’s style, both are well-researched, and the analysis in each is absolutely top-shelf. Indeed, Franco often improves on the published analysis of others, and particularly in the Rubinstein book. There are some who absolutely adore Lakdawala’s color, wit, and total lack of restraint. There are others – count me among them – who find it all just too cute by half. The good news is that some of the worst of Lakdawala’s excesses seem to have been tempered in his two newest books, Fischer: MBM and Tal: MBM. The bad news is that they haven’t been tempered enough. Fischer: MBM consists of fifty six games, and like most of Lakdawala’s other biographical titles, it is structured thematically. The fifty-three games in Tal: MBM are ordered chronologically, making it unique in Lakdawala’s oeuvre. So what is it about Tal that prompts Lakdawala to abandon his standard book format? Part of what drives the shift is Lakdawala’s almost cartoonish caricature of Tal. His Tal is a tactical wizard, a “con-artist” with an “aversion to swaps of any kind,” an alchemist whose guiding principle in chess was “[w]hat would Satan do?” (153-4) and whose sacrifices were rarely sound. (246) If Tal was indeed this one-dimensional, it wouldn’t make sense to waste time on endgames or defensive motifs. The problem is that more recent and sober studies expose the fallacies of this interpretation. Tukmakov, for instance, shows in Risk and Bluff in Chess that Tal’s sacrifices were often correct, even by modern standards. And Karolyi – who is cited in Lakdawala’s bibliography – takes care to point out Tal’s “skill in quieter positions and endgames” (8) in his Mikhail Tal’s Best Games, Volume 1. People of good faith can disagree about a writer’s style. The real problem with both Fischer: MBM and Tal: MBM is a lack of rigor and serious research. Bibliographies for both books are slight, and Lakdawala’s failure to engage other analysts and biographers undermines his own work. Example #1: in analyzing the 19th (not the 18th, as appears in Fischer: MBM) game of the 1972 World Championship, Lakdawala has this note after 24.exd5: “White’s only chance for the win lay in 24.Rc7! Nxd4,” and he gives a line of Houdini-inspired analysis to justify his claim. (Fischer, 203) But as early as 1972 Olafsson and Timman both correctly saw that 24…dxe4! holds the balance. This move is also found in Kasparov’s My Great Predecessors IV, a book that appears in Lakdawala’s bibliography. Example #2: Consider Tal-Smyslov, Candidates 1959, round 8. After 1. e4 c6 2. d3 d5 3. Nd2 e5 4. Ngf3 Nd7 5. d4 dxe4 6. Nxe4 exd4 7. Qxd4 Ngf6 8.Bg5 Be7, why did Tal avoid the superior 9.Nd6+ in favor of 9. O-O-O? For Lakdawala, this is evidence of Tal’s emotional irrationalism (Tal, 148-9) – he was ‘bored’ by endgames so he avoided them! Kasparov and Karolyi have a simpler explanation: Tal thought that Smyslov would be more comfortable in a worse endgame than an unclear middlegame. What’s maddening about Lakdawala is that he can, when he chooses, produce excellent work. There is less nonsense in Fischer: MGM and Tal: MBM than in previous efforts, and there is more clear explanation of ideas. But there are no new insights in either book; instead, we get questionable psychologizing and a lot of stream-of-consciousness fluff. If you like Lakdawala’s other books, you’ll like these; if not, you won’t. Caveat emptor. That seven books on widely disparate players have a more-or-less identical structure – sections on attack, defense, dynamism, imbalances, accumulating advantages and the endgame – is disconcerting. Surely books on, say, Kramnik and Kortchnoi should not be identically structured . This entry was posted in biography, Game Collections and tagged Alekhine: Move by Move, Craig Pritchett, Cyrus Lakdawala, Everyman Chess, Fischer: Move by Move, Karpov: Move by Move, Move by Move, Rubinstein: Move by Move, Sam Collins, Spassky: Move by Move, Stein: Move by Move, Steinitz: Move by Move, Steve Giddens, Tal: Move by Move, Thomas Engqvist, Zenon Franco on October 2, 2016 by fullcityplus.